"Look at the root word of terrorist—terror. How can anyone wonder whether these people are right or wrong? They've got terror right there in their name. Do they have to spell it out?" The frenzied election year of 2004 will be remembered by moviegoers as the breeding ground for countless political documentaries ranging between observational (Control Room) and forceful attack (Fahrenheit 9/11) pictures. The success of these films varied considerably, and it has become extremely difficult to quantify their impact on the eventual results. Even if their effect was minimal, the films provided a thought-provoking antidote to the typically mind-numbing megaplex fare (White Chicks, Taxi, etc.) Writer/director John Sayles also hoped to make an impact on audience�s views prior to the November election. The renowned independent filmmaker chose to craft a fictional story instead that mirrored certain real-life leaders. Released domestically in September, Silver City presents a corrupt political system with little hope for any type of revolutionary change. The aptly named Dickie Pilager (Chris Cooper) is the front-runner for the governor�s seat in Colorado and exhibits some traits that may remind viewers of our current leader. He speaks in very simple terms and says nothing beyond the typical political rhetoric. His dim-witted comments often make little sense, but they appeal to the masses looking for a �direct� candidate who doesn�t speak above their heads. Dickie�s Karl Rove is Chuck Raven (Richard Dreyfuss)�a nasty, win-at-all-costs campaign manager who will not settle for second place. The wealthy man behind the scenes is the ruthless Wes Benteen (Kris Kristofferson), who needs an ally in power who is moldable. Victory on election day appears imminent for Dickie, but a strange occurrence may reveal some troubling details that could jeopardize his victory. While shooting a hypocritical campaign advertisement near a pristine stream, Dickie reels in an inexplicable dead body. This action is probably a random coincidence, but Raven suspects foul play and hires private investigator Danny O�Brien (Danny Huston) to check on his enemies. Although Dickie seems designed to be the focus point, the story�s primary figure is actually Danny, a former journalist who once stood on the opposing side of power-hungry guys like Chuck Raven and Wes Benteen. He maintains his sharp investigative skills, but his life is in shambles and does not need another professional conflict. Danny�s work begins by doing the typical interviews with police officers and Dickie�s enemies. However, the story takes a different turn when he begins looking into Benteen�s attempted sale of Silver City. His discoveries may place Danny into conflict with his employer, but they also could reveal a sinister plot. When he crafted Silver City, John Sayles realized he was sticking his neck out for harsh condemnation, and critics were more than happy to oblige him. However, the maverick filmmaker has never been afraid to take a chance, and his efforts lead to a compelling film. Utilizing a sparse five-million-dollar budget, Sayles has brought together one of his best ensemble casts, which lends authenticity to the story. The veteran group also includes Maria Bello, Thora Birch, Miguel Ferrer, Daryl Hannah, Mary Kay Place, and Tim Roth. Many appear for only a few scenes, but their characters do occupy an essential place in the story. In the lead role, the relative unknown Danny Huston makes the hero unconventional and more intriguing than you might expect. Danny tries to retain a light tone and not worry about his life, but it�s largely a disguise to avoid dealing with his past mistakes and former girlfriend Nora (Maria Bello). Huston and Bello have a nice chemistry and subtly reveal that a possibility for love may remain. 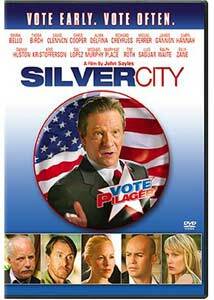 Silver City�s harsh portrayal of our political process works apart from its satirical look at our current president. Chris Cooper does a wonderful job in making Dickie more than just a caricature of an actual person. He provides the hilarious verbal missteps that make us think about Bush, but it never feels like just a dead-on imitation. Cooper�s true skill lies in making us sympathize with Dickie, even though his election could be devastating. The real enemies are Wes Benteen and Chuck Raven, as they understand exactly why his victory is necessary. Sayles indicts everyone including the leaders, behind-the-scenes puppet masters, and even us for helping to bring about our unfortunate current system. In typical Sayles fashion, the ending offers a happy moment, but also reveals the possible futility of trying to rectify flaws in the government. Image Transfer Review: Silver City provides a solid 1.78:1 anamorphic widescreen transfer that does face the limitations of the low-budget production shot in 16 mm. While the picture avoids any major defects, it does include a significant amount of grain that relates to its origins. There are some impressive outdoor scenes that offer attractive colors, but the overall transfer could be a bit sharper. Considering the technical restrictions of the budget, however, the images deliver an effective presentation. Audio Transfer Review: This release includes an adequate 5.1-channel Dolby Digital transfer that becomes difficult to review because the story is almost composed entirely of dialogue. The conversations are clear throughout the presentation, which is all you can really ask for with this type of audio transfer. Extras Review: Silver City includes two significant extra features: an impressive 34-minute documentary and a feature-length commentary from writer/director John Sayles and producer Maggie Renzi. The Making of Silver City takes an informal look at the film's origins and provides interviews with numerous members of the cast and crew. Shot on digital video, the piece matches Sayles' unconventional style and avoids the promotional fluff inherent in many "behind-the-scenes" extras. The actors seem genuinely enthusiastic about the project and enjoy discussing their role. Some of their comments simply describe the characters, but these moments only slightly denigrate the overall product. Sayles and Renzi talk about their reasons for choosing the project, which relate to our current frustrating political climate. Commentary tracks from Sayles always include abundant information, and this release is no different. Renzi joins him to offer additional details, which are decent but unfortunately give him less time to speak. Not coincidentally, the duo recorded the commentary on Election Day, so their feelings about the upcoming results remain positive. Sayles always does a great job in making the technical details interesting, and his enthusiasm is prevalent during this track. Renzi spends a bit too much time offering the typical "that actor is excellent" comments, but her appearance does allow them to utilize a lighter, more conversational tone. This disc also includes an abundant collection of trailers for Silver City and ten other movies that generally correspond with this film's independent nature. Three previews appear before the menu, which is always annoying, and the rest are available there. If you enjoyed Sayles' work in this film, check out the trailers for the classic (Sunshine State and the children's story The Secret of Roan Inish for more of his pictures. John Sayles has always injected social statements into his films, but has rarely offered such blatant criticism of specific real-life figures as those in Silver City. This story avoids becoming a one-note satire by focusing on the human elements within the political corruption, which leads to an intriguing film. Many critics have derided Sayles for his obvious criticism of our president, but they often missed the tale's strong personal aspects. Hopefully home viewers will give this underrated picture a second chance.